Tree Trimming at PES is not a holiday event, but a necessary everyday part of assuring that your electric service survives storms and falling limbs. Nobody wants to lose the beautiful expanse of healthy vegetation, but we all know the dangers of allowing the lines, supporting poles and substations to be knocked out or down during a storm. At PES we try hard to find the balance between making sure that your service is not disrupted and the need to trim back trees and other growth that endanger your service. Vegetation is a vital natural commodity. It provides needed shade in summer, helps clear the air of pollutants, provides a home for wildlife and pleases the eye with the beauty of its foliage and blossoms. When vegetation comes close to or in contact with utility power lines, a potentially hazardous situation is created often resulting in an electric outage. 6 feet of separation is required between all customer shrubs, trees and fences and PES Energize pad-mount transformers. 2 feet of clearance around meter bases. In some instances, tree removal is the option that is the most beneficial to both PES and the property owner. Tree removal is the permanent solution. Repetitive trimming of fast-growing trees located directly under the lines is a costly, temporary fix. Many trees must be trimmed extensively in order to keep power lines clear. Unfortunately, such extensive trimming may cause the tree to develop internal decay and the tree may become a hazard not only to PES electric lines, but also to surrounding property. Anytime PES removes a hazard tree during the normal trimming cycle, a replacement certificate may be issued for a tree on the approved tree list. The value of the tree replacement will be listed on Operating Policy 2-6. In lieu of a tree replacement certificate, PES may do away with the stump of the removed tree. This program is to encourage positive negotiation with the property owner and encourages selecting trees with size and growth characteristics that are not hazardous to PES electric lines. PES will clear undergrowth with a brush-cutting machine, tractor or mower. Sprayed liquid herbicide will be used to control woody-stemmed plants in the right-of-way. By using herbicides instead of clear cutting, PES will be able to target unwanted species of trees for removal while allowing “low growers” and native grasses to thrive. This creates a better balance between utility and the environment. Prior to maintaining the right-of-way, PES will attempt to contact the property owner using information available to PES. PES will only recognize the property owner or his/her pre-established designee as an individual having authority to make permanent decisions concerning the alteration of property. The property owner may establish the conditions for access to the right-of-way work area but cannot unreasonably deny access to PES employees. PES will be responsible for all repairs to property damaged while maintaining the right-of-way unless the damaged property infringed on the designated right-of-way area defined in the policy. PES will remove all debris trimmed using handsaws and will rake clean any manicured areas. PES will use the lateral pruning method that is outlined in the American National Standards Institute (ANSI) A300 standard. Lateral pruning removes branches where they meet the closest lateral branch that is at least one-third the diameter of the original branch and that grows away from the electric line. If there is no lateral branch to prune to, however, the limb must be removed at the tree’s trunk. That leaves a healthier tree with no stub to decay and prevents the growth of weak sprouts. 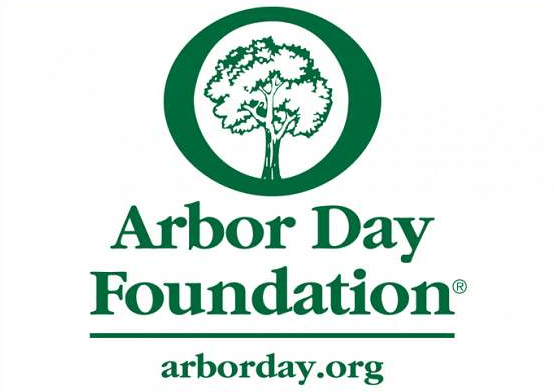 The National Arbor Day Foundation, International Society of Arboriculture (ISA) and National Arborist Association recommend this standard. 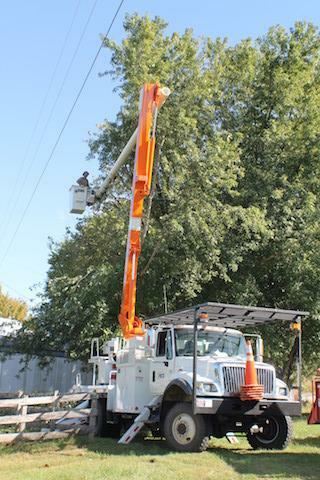 PES will train and certify its employees on proper tree pruning, vegetation care and utility tree trimming safety following ANSI, ISA and other suitable standards. 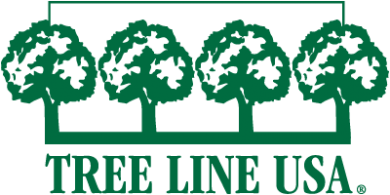 PES has practiced ANSI cutting and has received annual recognition from Tree Line USA since 2011. Proper pruning may mean removing branches beyond the designated minimum 50 feet of clearance for distribution lines or 75 feet for transmission lines. If the closest proper-size lateral branch is farther away than the minimum clearance, the limb will be removed to the proper joint for the health of the tree. By directing growth away from electric lines, lateral pruning results in less future pruning, which reduces the visual impact and the cost of pruning. 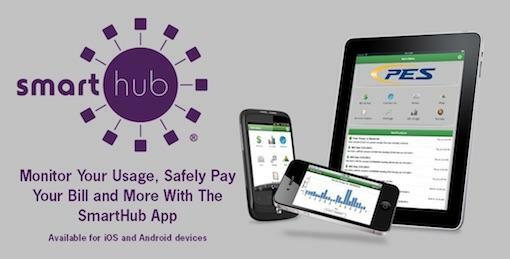 Controlling vegetation management results in cost savings for PES customers. For new services, it is the homeowner’s responsibility to prepare the right-of-way area as designated in sections 1 and 2. The right-of-way will be inspected and must be approved for compliance prior to construction. PES will not be responsible for landscaping repairs for new construction. To encourage community education and involvement in vegetation management, PES participates in annual Arbor Day activities. 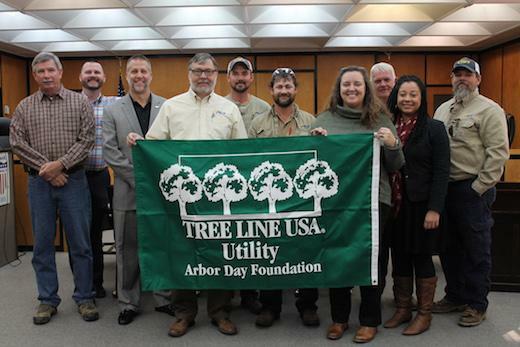 PES donates 10¢ per customer per year to establish new wooded areas in the Pulaski, Giles County area, as outlined in the Tree Line USA program. Click the logos to learn more.